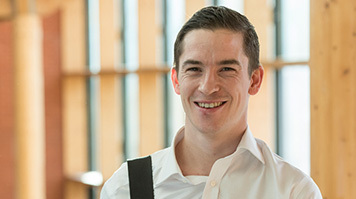 As the recipient of a Vice-Chancellor's Scholarship for excellence, Irishman David Cullen could be forgiven for pinching himself – university seemed a long way away when he left school earlier than most. "I actually left school at 16," recalls David, "despite achieving good grades. I felt that I wanted a hands-on career, so I undertook a bricklaying apprenticeship and worked in a number of cities across Ireland, including Limerick, Cork, Dublin and Waterford." After six years working as a bricklayer in Ireland, David moved to Australia for a year and, when his visa expired, decided to ply his trade in the UK. "After a year or so of working in the UK, I decided I wanted to learn more about the industry from a professional standpoint," says David. "It was a hard choice to make, because I have a real passion for bricklaying, but I took the advice of a semi-retired bricklayer I had met on-site once. He told me that if you had the ability to use your hands and your mind, you should use your mind. I decided to take that advice and study for a BSc (Hons) Property Management (Building Surveying)." It's a decision that paid off in spectacular fashion for David, laying the foundations for an outstanding academic career. "I had a lot of catching up to do to start with," he recalls, "and undertook extra-curricular activities to improve things like my essay writing. It all paid off though, and in my second year I was awarded the CIOB Queen Elizabeth II Jubilee Fund Award for academic excellence. " Excellence was a by-word for David's educational experience, as he went on to graduate with a First Class honours degree, with an overall grade of 78%. Equally important was the ambition that his undergraduate degree had instilled in him. "The modules I took as part of my undergraduate degree enabled me to develop an interest in the contractual and cost-related side of the industry," explains David, "That's given me the desire to become a Chartered Quantity Surveyor, and I'm working hard to turn that ambition into reality." One part of that journey is undertaking an MSc Quantity Surveying at LSBU, something that David feels will help him to develop the skills he is picking up while working as a Trainee Graduate Quantity Surveyor. However, funding his studies presented a formidable barrier for David. "I genuinely did not think I would be able to afford the tuition fees," he explains. "That's why I applied for a Vice-Chancellor's Scholarship and I was overwhelmed with joy, astonishment and gratitude when I discovered I had been given a scholarship in the field of excellence, thanks to my achievements at undergraduate level. Without the scholarship, my MSc would not have been financially viable, to put it simply." David is now working hard to ensure he makes the most of the opportunity, and aims to pursue membership of the Royal Institute of Chartered Surveyors. "It's been a tough journey, and I've had to work very hard," he says. "But I'm incredibly grateful to LSBU for giving me this opportunity, and I'm determined to become a successful Chartered Quantity Surveyor. And if I can do it, you can do it too."